LJIC Massage Therapy student can’t wait to begin a career giving people relief. “I’m never going to work another day in my life.” That’s what James Rucker just told me. He’s on the other end of the line as I interview him for a La’ James International College news story. 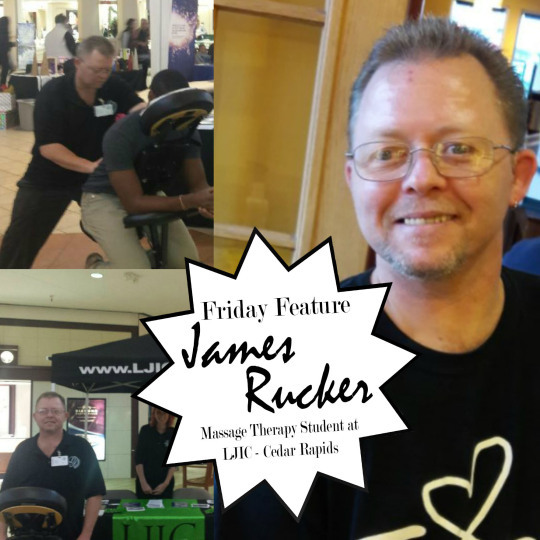 Rucker is a massage therapy student at the Cedar Rapids campus and he has my attention. I’m wondering if he won the lottery? Or maybe there’s a rich uncle with a big trust fund? It turns out it’s neither of those, instead he means this: If you do what you love, you’ll never work another day in your life. It’s a famous quote and if you haven’t heard it, you soon will. Rucker doesn’t mean that doing what you love will stop you from needing money, that’d be nuts, but if you love what you do, it’s kinda like not working at all. Rucker says he mostly worked security jobs and retail prior to this. The praise felt good, but it felt better to be able to GIVE. And it feels great knowing a career is ahead doing more of the same. “I’m looking forward to more days like that,” Rucker tells me and I think to myself that indeed, James Rucker isn’t going to work another day in his life. What does your career path look like? Contact LJIC today at 888.880.2108 for a future you can be passionate about!